There are many different kinds of fisherman's knots. These are the basic knots used in rigging a fly fishing outfit that you should be familiar with. Learn these basic knots and have some fun. It makes sense to practice tying these knots at home before you are on the river. Remember that fly fishing knots are the typically the weakest connection between you and the fish. 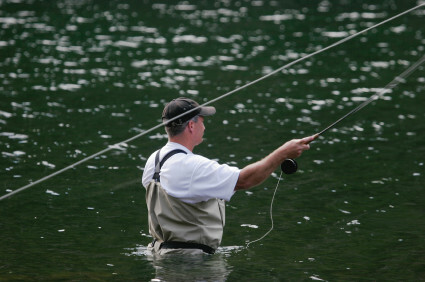 Many beginning anglers lose fish due to poorly tied knots. Tying knots is something you need do right, not fast. Speed comes with time and practice makes perfect. Here is some of the basic fly fishing knots used when assembling your new outfit. They are the arbor knot, albright knot, nail knot, double surgeons knot, and improved clinch knot. Start assembly at the reel by securing the backing to the spool. Backing is used to provide capacity to your reel as most fly lines are less than 100 feet long and a large fish would certainly end up running off with your fly line. Next you will connect your fly line to your backing. This step requires a knot that can securely attach your expensive fly line to your backing. Since both materials are different (Dacron to plastic) the most common knot here is the Albright knot. Your leader is designed to turn your fly over when casting. The nail knot provides a clean and effective connection that leaves the leader in a straight connection from the fly line. This is important for casting accuracy. Some anglers prefer a Dacron or Mono loop here and some fly lines already have a loop connection built into the end of the line. If yours already does then you can attach your leader with a loop to loop connection. The double surgeons knot is suitable when connecting two similar diameters of monofilament together like the tippet and leader end. The tippet is the section of mono fishing line between your fly and your leader. By adding a tippet section you can extend the life of your tapered leader by simply replacing a worn section or changing the tippet diameter for a smaller or larger fly. As the final step it is also the most frequently performed by anglers. It is critical to insure you have a strong knot here or you will certainly lose flies and fish. There are many choices for attaching your fly to your tippet. The most important for you is consistency. Learn a few different knots for this and practice until perfect.